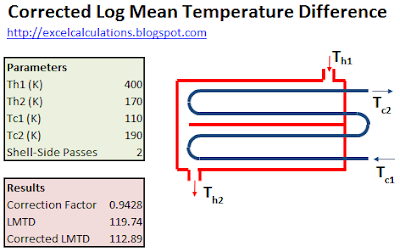 This Excel spreadsheet calculates the corrected LMTD for shell-and-tube heat exchangers with multiple shell-side passes. True log mean temperature differences are only valid in double-pipe (or tubular) heat exchangers; hence for more complex shell-and-tube arrangements, we have to muliply the LMTD by a factor. 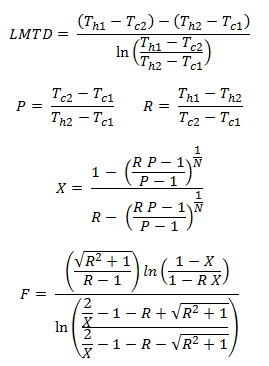 The equations used in the spreadsheet are taken from the work of Bowman et al (1940) and are given below. Note that R is the temperature change ratio of the hot and cold streams, while P is the temperature change of the cold fluid divided by the maximum temperature difference. F is the LMTD correction factor. Perrys Chemical Engineers' Handbook states LMTD correction factors lower than 0.8 indicate inefficient heat exchanger design, while the Heat Exchanger Design Handbook advises that the minimum value should be 0.75. Awesome post about heat exchangers! I have been trying to do some research on them because I might need them for my job, your article has helped a lot. Thank you for sharing this with us! I'm a newbie in heat exchanger. I'm still studying LMTD method. But, I'm confused in choosing correction factor F. In Schaum series of "THEORY AND PROBLEM OF HEAT TRANSFER", I find some chart of correction factor each heat exchanger. When i use that chart to calculate F. My answer is wrong. I try to get other books but it doesnt work. Any body help me please.